This story was updated at 9:12 a.m. EDT on July 10. Backyard astronomers, rejoice. There's a celestial party in the sky this summer, and you won't want to miss the season's dazzling sights, as five planets shine so bright you'll be able to pick them out with the naked eye. 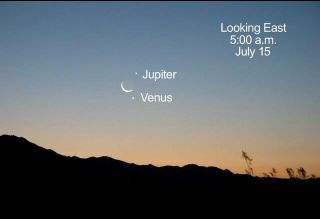 Throughout July, Venus and Jupiter will steal the show, as the two most luminous planets blaze brightly in the early predawn sky. Next month, in August, the cosmic trio of Saturn, Mars and the bright star Spica will put on a heavenly dance for observers shortly after sunset. Currently, Venus and Jupiter appear as two bright beacons in the early morning sky, visible roughly one to two hours before the sun rises in the east-northeastern sky. Venus and Jupiter are now in the vicinity of the V-shaped Hyades star cluster, which is located about 153 light-years from Earth. Last weekend, the planetary duo lined up with the bright star Aldebaran, which forms the unblinking red eye in the constellation of Taurus (the Bull). On Monday (July 9), Venus and Aldebaran formed an intensely bright pair, with Jupiter appearing above them. Over the next week, the two planets will wander closer together, capping their celestial rendezvous on July 14 with an encounter with the picturesque crescent moon, Rao explained. Each morning leading up to July 14, the planets will be changing positions in the early morning sky, but they are so bright they should be fairly easy to spot with the naked eye, provided you have good weather conditions. To find Venus and Jupiter, look toward the east-northeast (in the general direction of where the sun will rise) at around 4 a.m. or 5 a.m. local time. The two planets should appear low in the eastern sky, as bright, silvery stars that do not twinkle. And since no other objects in the sky should match their brilliance, the planets should be easy to spot, Rao said. "Venus especially, and Jupiter to a lesser degree, should stand out like sore thumbs," he said. "Given good weather conditions — and if you have the gumption to set your alarm clock for that hour — you're certainly not going to be disappointed." If you find Venus in the sky before sunrise and keep your eyes on it, you might even be able to see it after the sun comes up, Rao added. "Venus will be shining brightly in the morning sky for the rest of the year, sticking close to the sun," Gaherty told SPACE.com in an email. "Jupiter, on the other hand, will rise earlier every night, moving into the evening sky around its opposition to the sun on December 3." Backyard astronomers may remember that Venus and Jupiter previously met up for several months at the beginning of the year, creating an impressive show in the night sky that lasted well into March. Next month, Saturn, Mars and the bright star Spica will take center stage in the southwestern sky at dusk, waltzing close together in an eye-catching scene. On Aug. 14, the trio will line up almost in a straight line, with Saturn, Mars and then Spica appearing from top to bottom. The three bodies will all be moderately bright but will shine in different colors: Saturn will appear yellowish-white, Mars will appear yellowish-orange, and Spica will appear blue, Rao said. To spot Saturn, Mars and Spica, look low toward the west-southwest roughly one to two hours after sunset. The positions of the planets will change daily, with Mars and Saturn dancing above the unmoving Spica. "This gets complicated because Mars and Saturn are both moving at different speeds, while all three are heading towards the sun," Gaherty said. On Aug. 21, the crescent moon will again make a cameo, joining Saturn, Mars and Spica low in the southwestern sky at dusk. Several days before this close encounter, on Aug. 19, Saturn, the moon and Spica will almost form an equilateral triangle in the evening sky. By mid-August, Mars, Saturn and Spica will appear rather low in the sky, only about 10 degrees above the horizon, Rao explained. Remember that your clenched fist held at arm's length measures about 10 degrees, so the three bodies can be found approximately one clenched fist above the horizon about 90 minutes after sunset. In fact, it's important to remember that the so-called conjunctions happening over the summer are all low in the sky, so keep that in mind when settling on a spot for stargazing. "Make sure you don't have anything blocking your view in the east-northeast this month, or west-southwest next month," Rao said. "Everything is going to be rather low in the sky when they're visible, so make sure there are no buildings or tall trees that might block your view of these objects." This skymap shows the positions of the planets Saturn and Mars, and the bright star Spica, in the evening sky on July 31, 2012. But that's not all. Another planet will be putting on a special show this summer: Mercury. Due to its close proximity to the sun, Mercury is often referred to as "the elusive planet" by skywatchers, Rao said. But this summer, there will be a small window of opportunity in mid-August to see our solar system's innermost planet in the predawn sky, when it is at its greatest elongation from the sun. According to Rao, a good time to try to spot Mercury in the eastern sky is 40 to 50 minutes before sunrise on Aug. 16. A helpful way to find the planet is to use the much brighter planet Venus as a guide. "At that time, Venus will be very bright and much higher in the sky," he said. "If you see a fairly bright star well below and to the left of Venus, that's probably Mercury." By the end of August, Mercury will be as bright as Sirius, the brightest star in the sky, but the planet will be much lower, and may not be as visible, Rao said. So, provided the weather cooperates, night sky enthusiasts should find a bounty to stare up at this summer, with the possibility of spotting five planets and two separate conjunctions with the naked eye over the course of July and August. "Because of the two triple conjunctions which are taking place all summer long, just about any night or morning will show neat, different, and constantly changing arrangements," Gaherty said. "And all of these can be seen [with the] naked eye, although some of the tight conjunctions will be more spectacular in binoculars."